Halo Reach's alien Elites will be bigger, a whole lot bigger, when the first-person shooter prequel to Halo: Combat Evolved finally ships later this year. Bungie just unbridled a galloping mountain of Reach-related text on their official news blog, drilling on everything from jet packs and pre-multiplayer match weapons load-outs to "popping player's shields" and all the new and varied "ways to die" in the game. Before we dive in, check out the multiplayer trailer released early last month, if only to ogle the assassination moves and game-rewriting jetpack-play. So bigger Elites (the sword-slinging aliens that one-hit-kill you). Faster too. As fast as a Spartan sprinting full out, says Bungie, making them "the most agile combatants on the battlefield in multiplayer." Not to worry, Bungie's planning Spartan vs. Spartan and Elite vs. Elite modes to keep things balanced, but hints at handicap rules in other modes that'll keep Elites from cleaning up effortlessly. Curious how assassinations work in geometric lingo? Imagine a 120-degree cone emanating Donnie-Darko-like opposite the direction a potential victim is looking in. If an assailant manages to creep up behind you and stay within that 120-degree zone, grab your ankles and kiss your tail armor goodbye. Note that standing behind someone isn't enough to enable the "assassination flourish." Watch their heads--where they're looking, that is--and position yourself along the opposing vector to trigger the finishing move. Popping shields no longer whacks health points commensurate with any damage overage, which sounds like a fantastic way to tick off snipers. Good news: The Long Rifle is exempt, so you'll be able to headshot-kill an enemy without a saving shield pop tipping then off to a follow-up bullet. The upside of capping damage transfer? In melee, you'll have a chance to react once your shields pop instead of instantly dying. Shields are no longer a continuous extension of your underlying health, in other words. 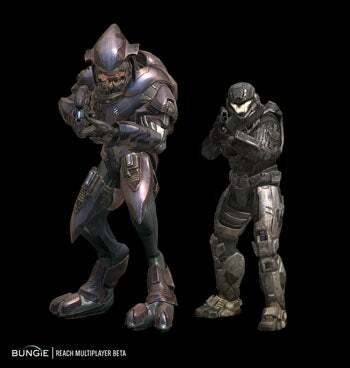 Armor abilities add a bit of Crysis to Halo's arsenal of player perquisites. Active Camo makes you invisible with the corollary that moving faster makes you less invisible and more rapidly depletes the ability. Armor Lock renders you temporarily invulnerable but roots you in place--including your ability to use weapons, judging from the graphic--meaning it'll be less tactically than strategically beneficial during team-based matches. Cool exit feature? An EMP blast that disables the shields of anyone unfortunate enough to be standing nearby. The Halo: Reach multiplayer beta kicks off in just under a month on May 3, 2010.